For years I have been saying that the Browlift is your Botox Detox. However, there is a new competitor on the horizon. On Sunday, I turned 54. My wife cooked me an amazing meal, having been inspired by her recent rendez-vous with her best friend at Rancho LaPuerta in Mexico (organic, feel good stuff). For years, we have subscribed to a ‘no present’ policy for Birthday’s. Celebrating another birthday is really just a gift itself. However, over the years, I have come to realize that ‘no present’ can be a tricky proposition. I have come to the opinion that a small gift can go a long ways. This year my wife gave me something that made me laugh, satisfied my sweet tooth, and is even a new addition to my office. 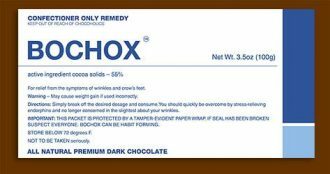 We’re talking about Bochox. It’s a chocolate bar, but not just any chocolate bar—it’s the perfect treat for all my Botox and Browlift patients!